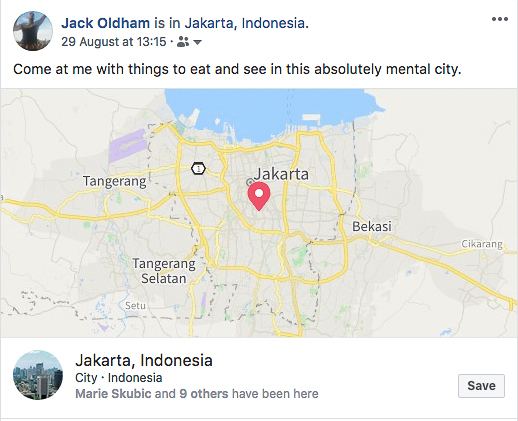 Some things come from nothing as Super Furry Animals once sang (any excuse to quote Gruff Rhys) and this certainly rang true on my first day in Jakarta. The start and finish of my Jakarta research! A few people came at me with suggestions, but it was this comment from a former colleague in Japan which stood out to me. You had me at ‘crazy’. 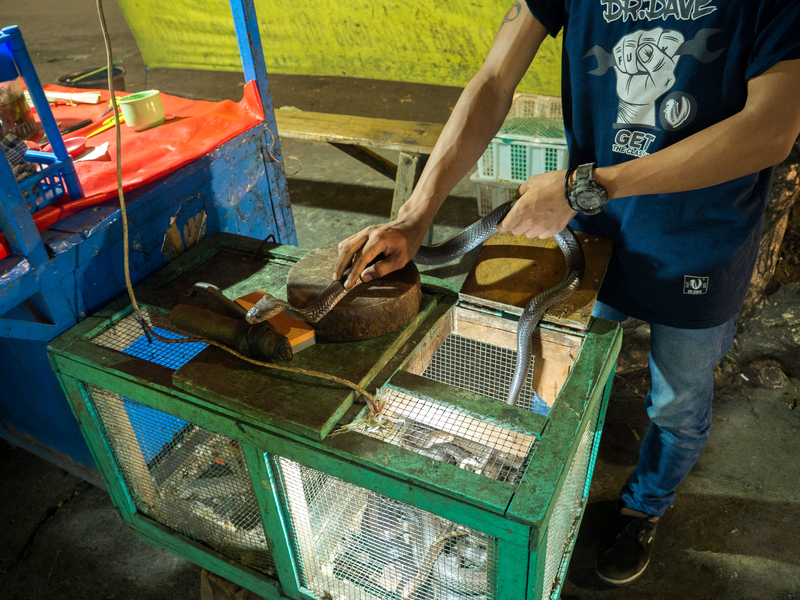 After a day of exploring the sights of Jakarta I rather predictably found myself in Glodok, the Chinatown area of the city hunting down my supper: cobra satay. Well, I say ‘a day’ spent exploring but in reality it was more like half a day – thanks jetlag! 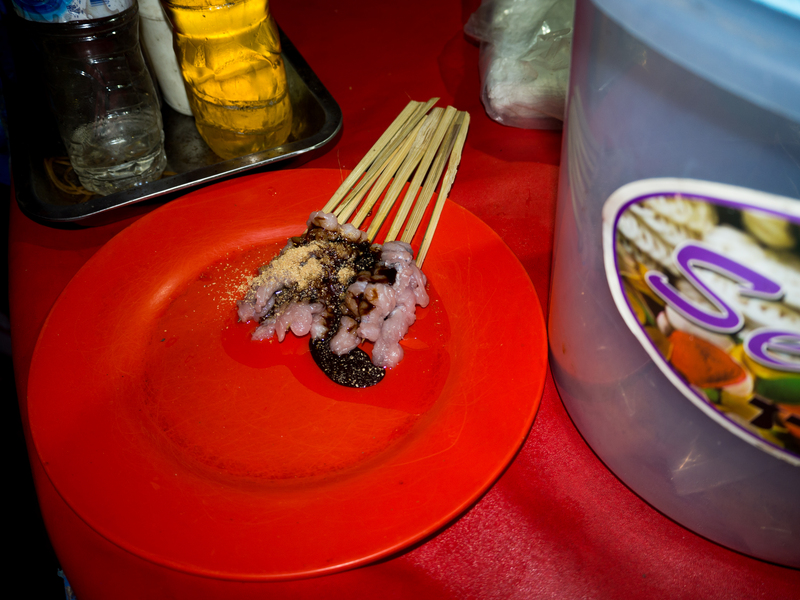 There wasn’t a great deal to be found on the internet with regards to this particular delicacy, so in the end I decided my best bet was to head for the supposed street food haven of Jalan Mangga Besar. It was an inspired decision, as one of the very first stands I saw was offering cobra. Don’t tell me you wouldn’t be at least a teeny weeny bit intrigued. 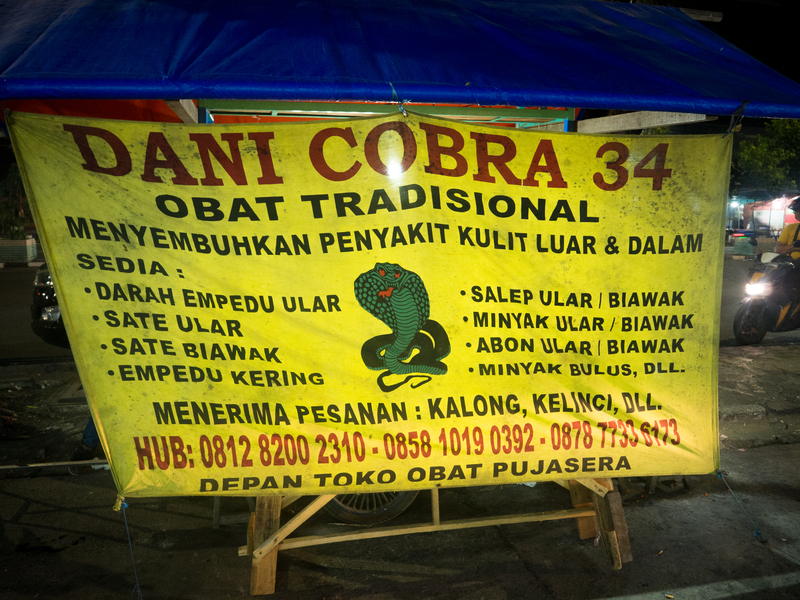 Unfortunately there didn’t seem to be anyone manning or showing any interest in serving at the first few cobra stalls, so I kept on walking until someone tried to give me the hard sell. I didn’t have to walk far before someone dragged me in by flexing his biceps and saying: “Cobra – good for stamina!”. I was offered the opportunity to select my snake of choice, but in all honesty I’m not sure what attributes make a good cobra so I left it up to him to probably choose the worst of the bunch for me! 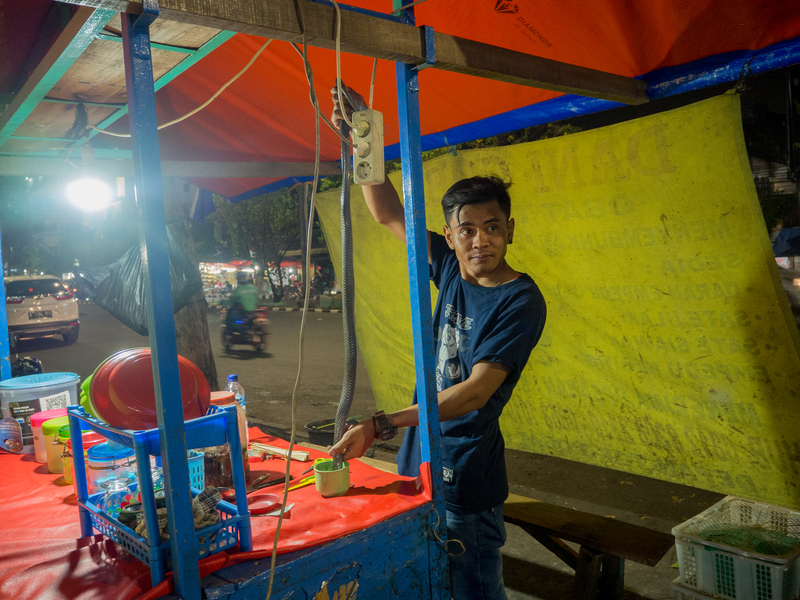 It came in at 100,000 rupiah (£5.18 at the time of writing) which seemed extortionate in comparison to the other street meals, although a man watching with his son assured me it was a good deal. The first step was indeed to chop the poor fella’s head off and drain its blood into a cup which would then be mixed with alcohol for me to drink. Remember guys: stamina. The snake was actually moving for quite a while after its death, which gave me instant flashbacks to dancing squid in Hakodate! Despite my reservations I couldn’t taste much except for the alcohol which was more than likely a good thing. I had fears of a repeat of that night in Beijing, but so far so good! Drink done, it was now time to crack on with the main event. 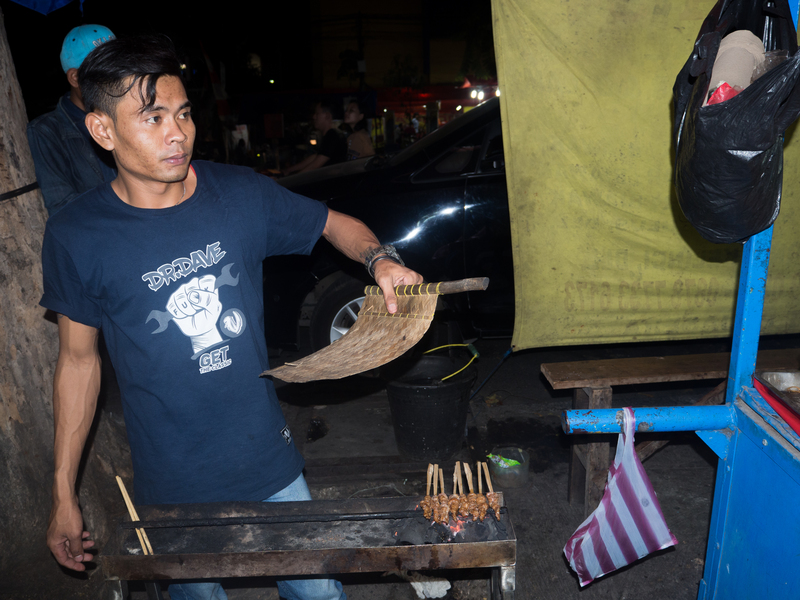 By this point a crowd had gathered as the chef (if we could call him that) was skinning and chopping up the snake before putting it on skewers ready to cook. I’m not sure whether the crowd was gathering because they’d never seen it before, or because they were looking forward to seeing a tourist throw up. The Gordon Ramsey of the cobra world. The meat was doused in a sauce before being put on top of the barbecue. In total I think there were about 10 skewers; in other words – enough to offer them around to the watching masses if I wasn’t a fan. Doesn’t look too dissimilar to chicken! They were cooked over a flame for some time – between 5 to 10 minutes and finally served up with a bit more sauce. It’s almost as if they were hiding something. So what was the verdict? Truth be told it’s quite hard to tell! 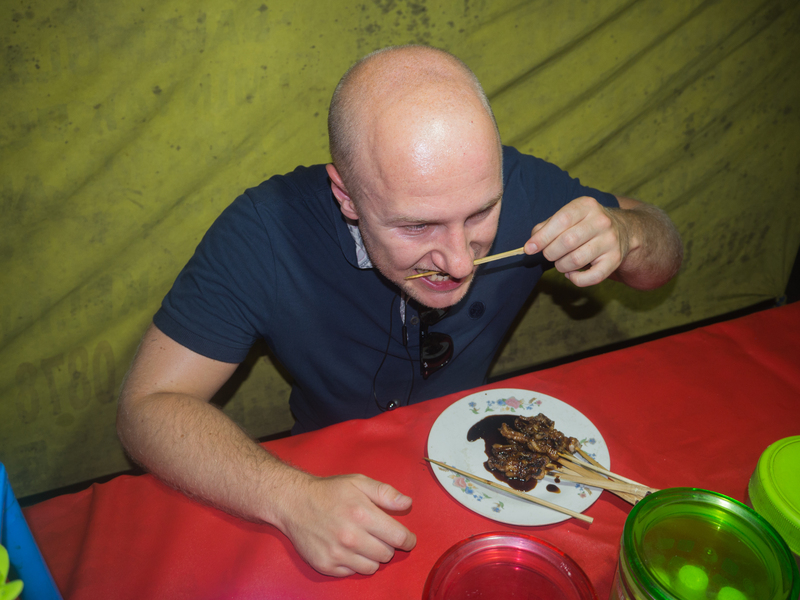 The taste was quite clearly masked by the sauce, which was nice but it wasn’t easy to differentiate between the flavour of the sauce and that of the meat. As for the texture, it was more than a little tough and chewy but that doesn’t bother me. At least there were no doubts over whether it was cooked or not! Whether I recommend it or not depends on how impressed you are by novelty value. 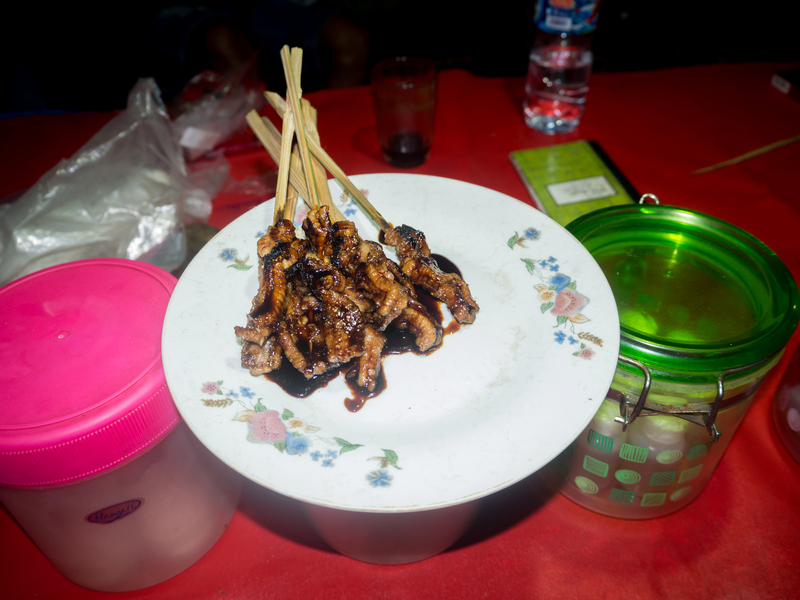 It wasn’t bad at all – the taste was fine and the texture was much more solid than I expected. That said you could quite easily get a much tastier street eat for a fifth of the price. All in all, worth it to say you’ve eaten it. Just don’t expect to be rushing back for more!